There are many obstacles in the Pikmin series. This page lists the ones that are more rare and less notable. Because they are rarely acknowledged by the games, their names are usually conjectural. Dew droplets falling on clovers in Downpour Thicket. Dew droplets (conjectural name) are drops of water that can stun Olimar in Hey! Pikmin. They only appear in one area, Downpour Thicket. Particularly: Find out the obstacle's internal name, and if its different, change the conjectural one accordingly. Downpour Thicket: This is the only area they are found in. They are found throughout the area, although they are abscent in underwater sections. There are also many Clovers in the level, which allows the player to shield from the dew. Particularly: find out the obstacle's internal name, and if it differs change the current name accordingly. A row of electric mushrooms in the Space of Silence. The electric mushroom is a small obstacle that hurts Olimar when he touches it in Hey! Pikmin. This mushroom constantly emits electricity, but can be deactivated by simply throwing a Yellow Pikmin at it. When it happens, the Pikmin bounces off a bit, the mushroom retracts, and Olimar can pass by. However, it only stays this way for a few seconds, before it returns to its original state. Space of Silence: The only electric mushrooms in the game appear here. They are mostly found in rows of three to eight, where they act as another electrical threat that the player has to pay attention to, alongside Electric Spectralids. Particularly: find out the obstacle's internal name, and if it differs, change the current name accordingly. Some floating bottles, with one dripping with poison water. Floating bottles are obstacles in Hey! Pikmin. They are found in the poison lakes of Septic Swamp, where they bob up and down and act as platforms the player can move across on. At certain intervals, some will sink into the poison lake, and then come back up again. How far down each goes depends on the bottle, and some even get completely submerged. The player can tell the lowest point it can get by looking at what part of it has poison water dripping off. Septic Swamp: This is the only area they can be found in, where they act as the "gimmick" of the level. The abundance of moving floating bottles consists of nearly all the terrain, creating more difficulty. 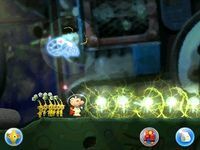 The player can easily get separated from their Pikmin if a bottle starts sinking, and their Pikmin can easily get lost and even die. 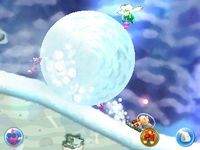 A large snowball rolling towards Olimar in Over Wintry Mountains. Large snowballs (conjectural name) are rare objects found in only one area of Hey! Pikmin, Over Wintry Mountains. They are huge snowballs that will roll forward, and can trample Captain Olimar. Hitting them with Pikmin can cause the snowball to be knocked back and become smaller, until it gets destroyed. It is unknown if it can crush Pikmin, since the only Pikmin type that is found in its level are Winged Pikmin. To do: Retreive the obstacle's internal name and describe it in the article. If it differs, also change the name of this section. Over Wintry Mountains: They appear frequently as Olimar rides the Getaway Vehicle. 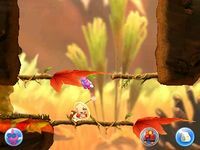 The player must either speed up or delay the object's momentum with Winged Pikmin. If it's in front of Olimar, the player must slow down. Two leaf platforms being blown forward. Leaf platforms (conjectural name) are obstacles in Hey! Pikmin. At first they hang down, but when wind blows they become parallel to the ground, and act like a platform that Olimar can walk on. Gale-Force Glen : These obstacles are found in this area only, and are mandatory if the player wants to make progress in the area. Blue Pikmin digging out a metal pipe. To do: Find the object's internal name, and if it's different change the name used here to match it. The metal pipe is a rusty pipe with a curve at the end found in a level of Hey! Pikmin. It serves as a staircase that allows the player to reach higher places. 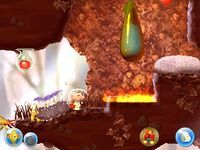 It originally is trapped deep in the ground, and Pikmin are required to dig it out, in a way similar to climbing sticks. 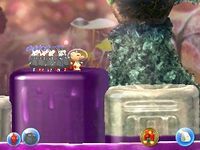 Once it is completely dug, the player and their Pikmin can then walk up it. If the player or a Pikmin is under it after the Pikmin complete it, then they can walk past it. After they walk past, doing so in the other direction will automatically make them walk up the pipe. Below the Ice: The only one in the game appears here, and is found in the bottom of a pool of water near the beginning. 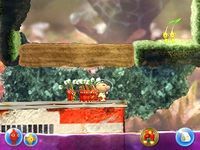 At first it can't be dug out, so the player must drain the water by breaking a clog. 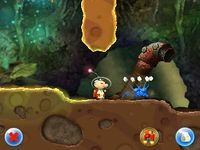 The player's Pikmin can then dig the pipe out, and It will lead to the ground above. A large poison geyser shooting out toxic gas. Poison geysers are obstacles found in Hey! Pikmin. They emanate from lakes of poison, and appear at regular intervals. Olimar will take damage if he goes through the obstacle, and any Pikmin that touches it will be killed. The rusted metal rod is an obstacle found in Hey! Pikmin only. This obstacle can be dig up by Pikmin (like the metal pipe), and it can be climbed up by Olimar and his Pikmin, just like vines. A solid dirt block in the Burning Bog. The solid dirt block is a variant of the dirt block. This obstacle is very rare and needs to be hit 6 times in order to be destroyed. There is also one found acting as a clog in Below the Ice. Below the Ice: Only one is found here, where it acts as a clog near the beggining of the level. Destroying it drains the lake, allowing the player to dig out a metal pipe and progress forward. A spiked pine cone right next to Olimar, rolling in a hallway. Spiked pine cones are obstacles found in Hey! Pikmin only. They are pine cones that resemble huge boulders covered with spikes. They roll around in the hallways that contain them, crushing anything in their way. They can kill any Pikmin they touch and harm Captain Olimar. Because there's no way to destroy them, the player has to be wary of them and try not to get caught by surprise. Some appear continuously from one point, fall down through the whole path, and disappear when they reach the bottom, while others roll back and forth in a confined space, never losing their momentum. The name comes from the game files: the model for these objects is inside togebokkuri.bch.z, which is short for とげ 松ぼっくり? (lit. : "spiked pine cone"). That said, the generator for these objects is internally called gimmick_spike_boulder_generator (as per /stage/map_0033.csv, which is the area's object generator file). Terror Trench: Spiked pine cones are found in this area only. They very common here, acting as the "gimmick" of the level. There are many narrow pathways that the obstacles move through, not giving the player much space to avoid them. However, there are still some small sections where the player is protected. A water sac above some fire. Particularly: Find out the obstacles internal name, and if it's different, change accordingly. The water sac (conjectural name) is a rare obstacle in Hey! Pikmin, exclusive to Barriers of Flame. It is a see-through green sack full of water. 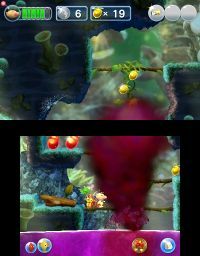 When destroyed with Pikmin, the water will drop out and extinguish any fire beneath it. 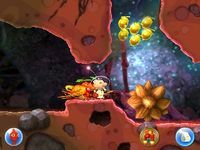 Barriers of Flame: They are only found here and serve as one of the ways to take out fires, considering Red Pikmin are absent. This page was last edited on February 20, 2019, at 17:04.